Capsule Summary: Sidney Freedman is called in when Hawkeye starts sneezing and can’t stop. I’m expecting a strong reaction in the comments section to this episode. I get the impression a lot of fans hate it. Yet there are many fans who consider it a solid episode. At the moment, it enjoys a 7.6/10 rating at TV.com and a similiar 7.3/10 at the Internet Movie Database. I don’t know about anyone else, but I’ve never heard someone sneeze the way Hawkeye does in this episode. It doesn’t sound like a sneeze, to be honest, which of course it isn’t. Alan Alda is doing his best to fake a sneeze but I’m not sure it’s something you can fake. Hawkeye’s sneezes start with a forceful inhalation before stopping abruptly. There’s no balance, no follow-through. They sound unnatural to me, which is why each and every sneeze pulls me out of the episode. If only the writers had come up with some other way for Hawkeye’s repressed memory to manifest itself. Cut out the absurd sneezes, and the episode improves dramatically. 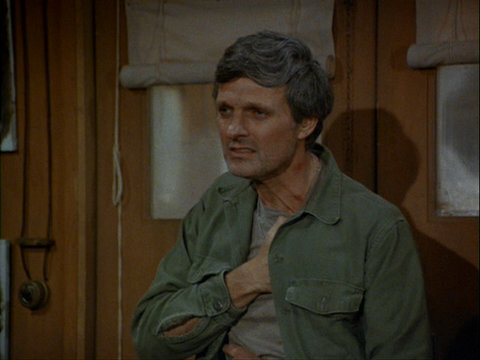 I may criticize his sneezing, but Alan Alda does a superb job selling Hawkeye’s terror and his sense of helplessness. Sidney suspects Hawkeye will figure out what’s wrong with him when he’s ready–and he’s right. A horrific childhood memory eventually resurfaces. When Hawkeye was seven, he was fishing with his beloved older cousin Billy and Billy pushed him into the water. Hawkeye almost drowned. He nearly died. Unable to handle the betrayal, young Hawkeye altered the memory so he wouldn’t remember Billy pushing him, only Billy saving his life. Contrast Hawkeye’s fear of what’s happening to him earlier in the episode with his hysterical wailing as he remembers his childhood trauma, remembers being pushed by Billy. It’s too much, too melodramatic. The wailing is particularly painful. That said, I have no idea how I’d react if I suddenly remembered my cousin trying to kill me when I was a child. Perhaps I shouldn’t judge Hawkeye too harshly for his histrionics. “Bless You, Hawkeye” isn’t a favorite episode but I don’t loathe it the way some do. It’s greatest failing isn’t fake sneezing or overwrought emotion, but repeating a storyline used earlier in the series. “Hawk’s Nightmare” from Season 5 is nearly identical. Rather than sneezing and scratching, it features nightmares and sleepwalking. In both episodes, Sidney arrives at the 4077th to help Hawkeye. In both episodes, Hawkeye is dealing with a psychological issue relating to his childhood. Hawkeye is convinced he’s going to die. This is the first of three episodes directed by Nell Cox. The others are “Heroes” from Season 10 and “Run for the Money” from Season 11. She directed more episodes than any other woman. In fact, she’s the only woman to direct more than a single episode. If for some reason you’d like to watch a supercut of every single one of Hawkeye’s sneezes from this episode, here‘s a link to a YouTube video. Enjoy. It looks like B.J. is playing pyramid solitaire in the Swamp right before Hawkeye starts tossing things out the door. Colonel Potter makes a Judge Crater reference in relation to missing keys to the lab. Crater famously disappeared in 1930. His disappearance remains unsolved to this day. I wouldn’t necessarily agree that its production was all “fun & games”, as the cover states, but I’m sure the cast & crew had some fun producing it. You should hear how my mom sneezes: she yells, “WAH-HOOOOOOOOOO!” Every. Single. Time. Count me among the fans who hate this episode. Honestly, it’s in my top 10 least favorites; I detest it. It’s overwrought, depressing, and a poor imitation of “Hawk’s Nightmare,” an episode I’m not a huge fan of anyway. Some may disagree, and that’s cool, but personally? I find this ep awful. I nearly mentioned something along those lines in my comment; I think I’d take this one over “Inga,” but in that scenario, I’m not coming out a winner either way. I have to agree with the person who said this is the worst episode. But then, most of the “post-Radar” episodes aren’t among my favorites, CBS should have cancelled the show when Radar left. I agree with RJ that it’s not the worst episode, although definitely not a fan of it. It’s nice to hear that someone else hated the sneezing as much as me though haha. The episode is actually not that bad at all except for that damn sneezing. It’s so LOUD and sounds so incredibly fake and forced, that like RJ said, it totally brings me out of the episode every time. Whenever this episode was on TV, I’d sit there with the remote in my hand so I could spam the mute button every time Hawkeye sneezes, especially the couple instances of multiple sneezes in a row. I’ve always wondered if that’s how a grown man would actually react to remembering something like that. Charles: Arsenic would solve your problem. I know it would solve mine. Definitely a perfect example of Winchester’s disdain for Hawkeye. Is it true that you can catch a cold by not wearing underwear, as Charles condescendingly told Hawkeye? Hawkeye’s sneezes really were overdone and his reaction to his cousin’s betrayal was excessively melodramatic. Most people probably know someone who had a traumatic event at some point in their lives but that person has suppressed it so deeply they don’t even know about it. Mental trauma is or can be just a as harmful as physical, and certainly has the ability to last a long time, even a lifetime. However, I have NEVER heard an actor, especially one of Aldas talent, think what he was doing sounded anything close to a sneeze. His overacting the crying scene when he remembers bully billy pushing him in the water is another scene that, as a viewer, is embarrassing to watch. He remembers the incident, lets out a primal cry/yell and it’s basically done. Could be wrong but seems to me something that suppressed causing that much of a physical reaction would take just a tad longer to get past once it surfaced. Overall, yah, pretty much can’t stand this episode. Delete it from DVR list when it records. Can NOT force myself to watch, listen, or care enough to understand the theme because I want to throw a rock through my tv at each sneeze. As a doctor, wouldn’t Hawkeye have known better to cover his nose/mouth when sneezing? With the lone exception of the walk through post-op, he’s spreading more germs than Typhoid Mary. Even Sidney covers his nose in his lone sneeze. It’s ironic that the tag has Sidney fake sneezing better in character than Alda does out of character. I used to think the episode was ridiculous and over-the-top too. I mean, why would he react like that, it was too much, embarrassing to watch. Then one day I found myself hysterically crying about something that happened to me as a small child during a therapy session. Utterly took me by surprise. After that this episode made a lot more sense to me, including Alda’s performance. \We watched two episodes every night after the houseful of kids went to bed. It was the ritual. I don’t remember this episode at all. I imagine I would not have liked it back then (the 1990s), since I just wanted to have a few laughs at the end of the day. But age changes one’s perspectives and priorities. Now, it seems like a very important episode. The medical conditions were mostly acute and from wounds. This little bit dedicated to resolving mental or emotional trauma -non-wartime PTSD -if you will, probably helped those who were ready to hear it, and can be ignored to those who do not need it. I have a feeling that Alan and the producers were trying to do an old fashioned type of comedy here in the Jerry Lewis style whereby funny sounds were all you need for a rip roaring hilarious episode. I don’t believe Alda thought sneezing that loudly into a microphone was realistic, particularly having heard him really sneeze during an interview. (It was much MUCH quieter.) I think the director thought it would make the audience roll in the aisles to hear such an absurdly loud sneeze. What a great idea to startle the audience and take them out of the story again and again by forcing them to experience the sound of someone screaming directly into their ears. The “sneeze” is just Alda screaming “AHHHCHOO.” With headphones you could blow an eardrum. When Potter pulled Hawkeye out of post op to see if he was contagious, he should have just said, “look son, your loud obnoxious scream-sneezing is disturbing the patients. Humor me and get out of here before we lose someone due to lack of rest.” Hawkeye would have understood that. I thought Alan Alda did a great job in his discussions with Sidney. The way the story about Billy just sort’ve tumbled out of him was very well done. Sidney eps are always entertaining. I wonder how Alan Arbus reacted or if he was even in the room when Hawkeye had his breakdown. It wasn’t as bad as I remembered it, but I couldn’t help but laugh when he screamed so unexpectedly. Alda is a great actor though and the tears seemed real and not pouring down like they usually do in scenes like this. It warmed my heart to see how concerned everybody was when Hawk thought he was dying. Even Charles was calling out instructions with a stricken look on his face. I loved how angry Potter was seeing one of his “kids” so sick and not knowing how to help him. Mulcahy pointlessly said he’d never seen anything like it. He’s not a doctor so I’m not sure what relevance that comment had. Couldn’t help thinking that if Frank had been there, he would have cackled maliciously and chirped, “serves you right PIERCE. For once, Dr KNOW-it-all can’t fix himself.” Then he would have skipped away laughing maniacally while Margaret was torn between her nursing instinct and her love for Ferret Face. I just saw this one for the first time in a long time. I found myself cringing at every “sneeze” by Hawkeye. Alda sounds like he’s just screaming “AHHH!” really loud. It’s painfully obvious that some other psychosomatic manifestation should have been used. The other bad part of the episode is Hawkeye’s overly dramatic howling when he remembers that his cousin pushed him into the water. In my younger days, I didn’t think his reaction was that bad; but now it seems way over the top. I don’t have a problem with him being upset, but it was just too much. Up until that point, it was a good scene between Sidney and him. That said (and even though the basic premise is similar to “Hawk’s Nightmare”), I don’t hate this one; I just won’t go out of my way to see it again. Except for the “sneezes” and Hawkeye’s breakdown, Alda did a good job of showing Hawkeye’s fright, confusion, and frustration throughout the episode. Charles and Potter both have some amusing lines. And Sidney is at his best. Agreed, there are a couple of instances where Alda really over-acts things, like in Hawk’s Nightmare, and the infamous scene in GFA, but this episode is by far the prime example of it. I never understood the sneezing in this episode. I feel like the director at some point should have been like “Alan, what the hell are you doing man, those are not sneezes!” Maybe just because it was so late in the series and Alda was basically “the man”, no one wanted to question him. It really ruins the episode and is one of the few episodes I basically refuse to watch. Not necessarily because it’s an overall bad episode, but just because the sneezing is loud to the point that I’m actually uncomfortable watching the episode in my own house.